The Summer Solstice – A Good time to track your Marketing and SEO! 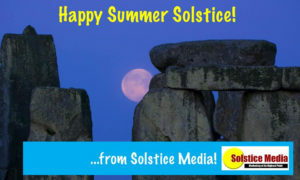 Happy Summer Solstice from SOLSTICE Media!! This is our 15th Summer Solstice as a Company and we are extremely proud to have helped so many businesses along the way! I was watching a special on TV about Science and Nature and the Narrator was discussing the Solstice and Equinox annual events. I was in the planning stages of starting my own business and one of the things I was doing was writing slogans, which summed up how I wanted potential clients to feel about my soon-to-be new business. I had felt pretty strongly about “Marketing at its Highest Point” Or “The Pinnacle of Marketing”. But I was always a bit afraid of the golf ball people suing me for use of the word “Pinnacle”! So I took a break from the planning and was watching this show during my dinner break. That’s when the Narrator stated the the Solstice occurred when the Sun was at its “Highest Point” above the Earth! I took it as a sign and “Solstice Media – Marketing at its Highest Point” was born! Know who your target is and where they “hang out”!! If you are selling soccer cleats, you want to be in soccer magazines, post to soccer forums, Write blogs using “soccer” as a keyword, Place Display Ads with images of soccer cleats and join every soccer group you can find on social media and share your posts there. Track your efforts. The advantage of online marketing compared to traditional media is a very well defined process of tracking your analytics. You have the ability to see how many hits you have, where they come from and which pages they visited. You never had that ability with print TV and Radio. We are very lucky to have these advanced tools. Stand Out from the Crowd! Be able to explain what makes you different from and better than your competition the instant you are asked. Don’t bash the competition, but rather state how your products and services best suit your clients’ needs and be able to back it up. Then tell the World! LISTEN! You will never know what a potential client’s needs are if you don’t listen to them. Here you are pushing soccer cleats when all they want are new laces. You can’t assume everybody needs or wants what you offer. Adjust and Adapt. The only constant is change. Read up on the latest trends in your industry. If you find your methods are outdated, then get up to speed! Research your competitors’ good ideas and improve upon them and offer them to your clients. After all, the competitors in your field are watching you! It’s that whole “keep your enemies closer” thing. Do Unto Others… The Golden Rule. Treat your clients with respect. Treat them fairly. Offer the greatest products and services that you possibly can for a price which is competitive yet profitable. Your reputation is the only thing you own that lasts forever, so make sure it’s a good one! These are a few things to think about as you review your successes and plan for the fall. The changes of the Seasons are a great time to do a quarterly review. Make sure to set goals and see if you reached them when doing these reviews. Please enjoy the longest day of the year and the first day of Summer! Happy Solstice! Please call us at (610) 529-0122.